This publication includes essays by Martin Brest and Prof. Dr. Matthias Bleyl. Martin Brest is an American director, producer and writer. Prof. Dr. Matthias Bley teaches general art history and 20th century art history at Berlin’s Kunsthochschule Weißensee. 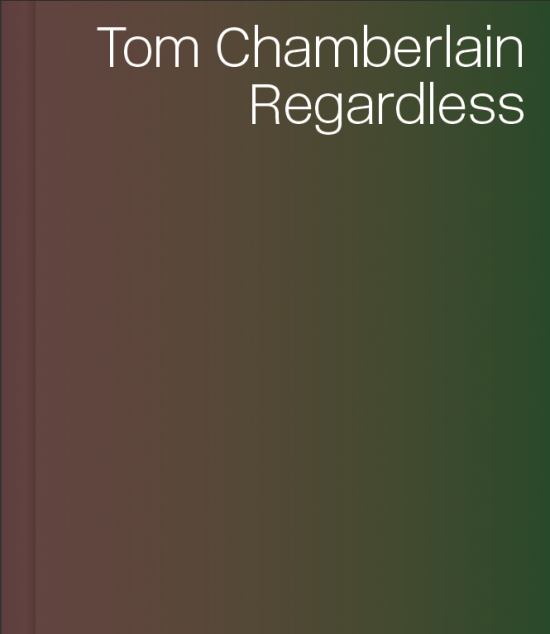 Tom Chamberlain (b. 1973, Barton on Sea) lives and works in London and Mexico. Studied at Royal College of Art, London (1999). Select solo exhibitions include Open and Shut, Obra en Obra, Mexico City (2017); If Not Now, Aurel Scheibler, Berlin (2015); Some other time, Scheiblermitte, Berlin (2011); Clockwise From the Left, Laika, Cluj, (2009); Paintings and Drawings, Aurel Scheibler, Berlin (2008); Regrets I’ve Had a Few, Mihai Nicodim, Los Angeles (2008); Sleeping standing up, Andreiana Mihail, Bucharest, Romania (2007); Undone, Chung King Project, Los Angeles (2006); Paintings and Drawings, Kontainer Gallery, Los Angeles (2004); Beside Myself, Percy Miller, London (2001); and Paintings and Drawings, Percy Miller, London (1999). Select group exhibitions include Au Rendevous de Amis, Aurel Scheibler, Berlin (2019); Simply a Painting, Kunstverein Wolfsburg, Wolfsburg (2018); Thinking Tantra, Drawing Room, London and Jhaveri Contemporary, Mumbai (2017/16); Nulla dies sin Linea, Satellite, Berlin (2016); Domino Dancing, curated by Ciprian Muresan, Plan B, Cluj (2014); Théâtre du Monde, MONA, Hobart, and La Maison Rouge, Paris (2014 13); System and Sensuality, KupferstichKabinett, Berlin (2013); Mrs. Darling’s Kiss, Arch 402, London (2012); I watered a horseshoe as if it were a flower, Mihai Nicodim, Los Angeles (2010); Drawings A - Z, Museu da Cidade. Lisbon (2009); Invisible Cities, Jerwood Space, London (2009); Small Wonder, Andreiana Mihail, Budapest (2006); and Closer Still, Tom Chamberlain and Serban Savu, Kontainer, Los Angeles (2008).